(see also the main page on the Eastern Telegraph Company). 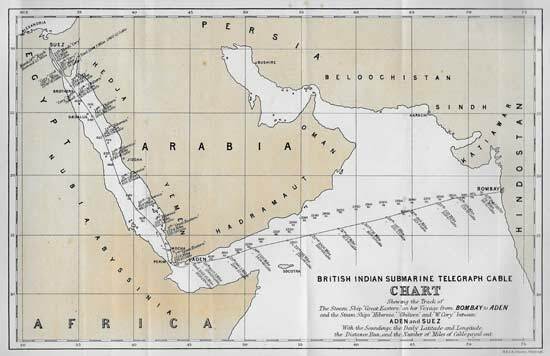 Following the success of the 1866 Atlantic cable expedition, plans were drawn up to lay a similar cable from India to Egypt. In December 1866 approaches were made, by William Shuter, secretary of the Telegraph Construction and Maintenance Company, to Lord Cranborne, Secretary of State for India, concerning such a cable and the possibility of the Government guaranteeing the interest on the capital required. The response was a polite refusal. In July 1867 Captain Sherard Osborn, Managing Director of the Company, approached the Secretary to the Treasury this time offering to lease the Persian Gulf cable, paying the Indian Government 5% per annum of the gross worth of the cable for a period of 30 years and to undertake all necessary repairs. In addition it would relieve the British Government of the need to pay the guaranteed sum of £36,000 payable, per annum, to the now defunct Red Sea Telegraph Company. 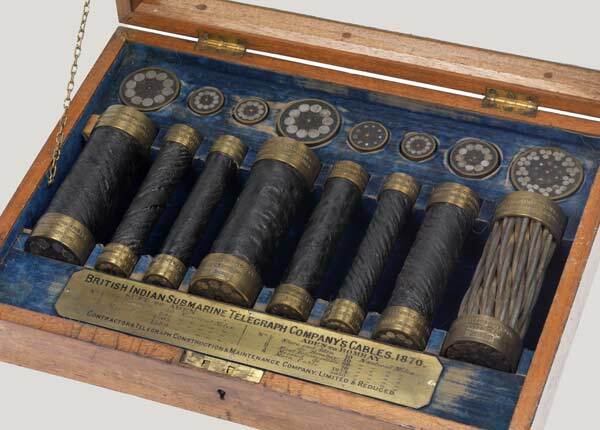 Osborn pointed out that a provisional contract had been signed for the manufacture and laying of such a cable, and a company, The Anglo-Indian Telegraph Company, with a nominal capital of £1,000,000 was in the process of being formed. A Government guarantee would assure its success. Though the company had in effect guaranteed to cover the Governments guarantee, the Treasury turned the request down. One request, for a Royal Navy ship to take soundings between Bombay and Aden, was taken up by the Admiralty, a frigate being sent to carry out the work. After this refusal the promoters led by John Pender set about raising the capital themselves. John Pender put up a substantial sum and the Telegraph Construction and Maintenance Company undertook to manufacture and lay the cable for £1,000,000 taking £460,000 of it in paid up shares of the new company. The balance was soon raised and the new company, The British-Indian Telegraph Company was formed with £1,000,000 capital. A contract for the cable was signed and it was ready in October 1869. The conductor consisted of 7 strands of copper wire each 0.048 inches in diameter. Six of the wires were wrapped around a seventh, which had already been coated with a mixture known Chatterton’s Compound, which consisted of 3 parts gutta percha, 1 part resin and one part Stockholm Tar. The completed conductor was then coated in Chatterton’s Compound, followed by a layer of gutta percha. In all four layers of Chatterton’s Compound and four layers of gutta percha were applied alternately, the finished core being a quarter of an inch in diameter. This was supplied in three mile lengths for making up into the finished cable. Once at Greenwich the core was wound onto a bobbin and placed in a tank of sea water for several hours and then electrically tested. If satisfactory it would then be wrapped in jute yarn soaked in cutch, this providing a bed for the armouring wires. The following details the characteristics of each cables make up. Latimer Clark’s compound consisted of a mixture of mineral pitch and ground flint, the latter to deter the teredo. All cables on completion were given a coat of this compound. Type ‘A’ – Main Red Sea cable. 1116.26 nm; laid by Hibernia 612.75 nm; Chiltern, 250.19 nm; William Cory, 253.32 nm. Armouring consisted of 12 iron wires one sixth of an inch in diameter, without the hemp wrapping, but with two layers of jute yarn, laid in opposite directions, these having been soaked in Latimer Clark’s compound. Type ‘B’ – Intermediate Red Sea cable. 323.73 nm laid by Great Eastern. 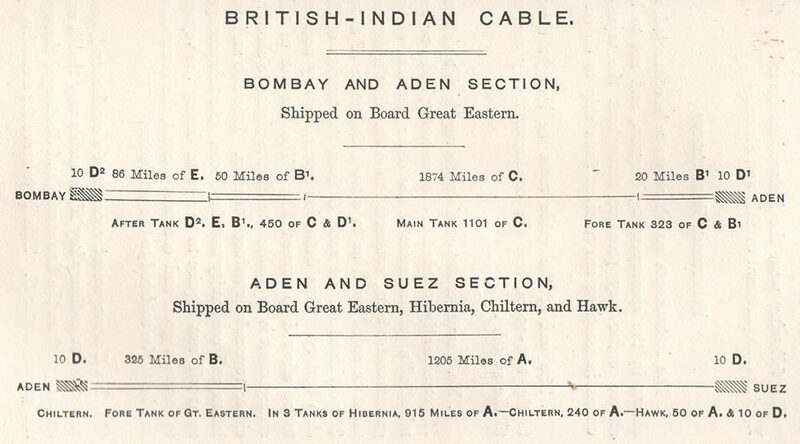 Type B1 – 2nd Intermediate Bombay - Aden cable. Armouring consisted of 12 wires each one fifth of an inch in diameter. 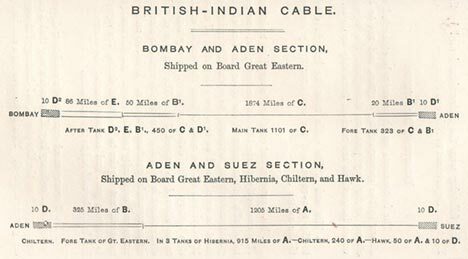 Type ‘C’ – Main Bombay – Aden cable. 1645.415 nm laid by Great Eastern. Armouring consisted of 9 iron wires one tenth of an inch in diameter, each covered with a winding of hemp which had been soaked Latimer Clark’s compound. Aden 9.98 nm laid by Chiltern; Suez 10.18 nm laid by Hawk. This cable and the following two had in addition to the standard armouring this cable had a further layer of 12 strands of iron wire each consisting of three strands of wire one fifth of an inch in diameter. 10.049 nm laid by Great Eastern. 10.02 nm laid by Chiltern. 86.046 nm laid by Great Eastern. Initially four ships were chartered to carry out the laying. Great Eastern, who would carry 2375 nm of cable, Chiltern, 260 nm, Hibernia, 915 nm and Hawk, 10 nm. Later William Cory was added to the fleet and Hibernia’s load was reduced to 615 nm with William Cory carrying the balance. Hibernia’s cable load was reduced to allow her to take on an extra 350 tons of coal enabling her to sail direct to Aden without the need to refuel. 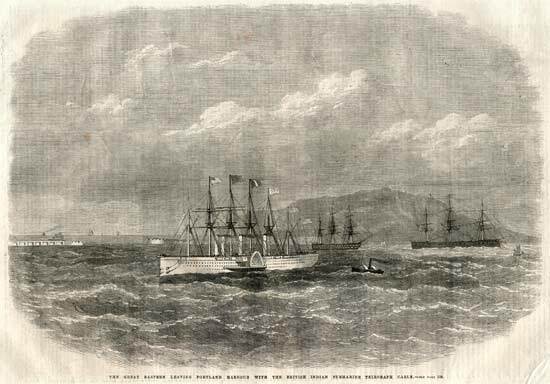 Great Eastern after loading cable and supplies at Greenwich sailed for Portland Harbour, on the 23rd October, to finish coaling and then sailed from there on the 6th January 1869. On the same day Chiltern left Greenwich, both bound for Bombay via the Cape of Good Hope. Great Eastern anchored at St Vincent, Cape Verde Islands on the 19th January, and left on the 25th, arriving at Cape Town on the 22nd December. Chiltern had arrived there on the 14th. The two ships left Cape Town on the 31st December and sailed together until they were off Algoa Bay when Chiltern went ahead and arrived at Bombay on the 26th January, Great Eastern arriving a day later, but stayed outside the harbour until the morning of the 28th. On moving into the bay two coaling vessels the Sydney Dacres and the Bates Family moored either side and began loading coal aboard. Later after coaling the Chiltern, the Howden joined the two vessels. Hibernia was scheduled to leave Greenwich at the end of November, but didn’t leave until the 30th December, which is probably the reason part of the cable was loaded onto William Cory, a late addition to the fleet. Hawk was scheduled to leave Greenwich in December and was due at Port Said in January and should have completed the laying of the shore end in the same month, but didn’t arrive until the 7th March. William Cory arrived the same day. On the 9th March at 1.00 pm William Cory entered the canal followed by Hawk. At 3.30 pm William Cory ran aground but was soon on her way. 4.03 pm William Cory ran aground again and after being refloated did the same at 4.20 pm. This time however she was well and truly stuck and Hawk had to continue alone, eventually arriving at Suez at 1.40 pm on the 10th March. William Cory finally made Suez at 2.00 pm on the 13th March. The various ships carried cable according to the tasks they were to carry out. Chiltern offloaded the Bombay shore end from the Great Eastern on the morning of the 1st February and on the 7th started laying it. A Government steam tug brought a barge alongside and two and a half miles of cable were coiled aboard. At 2.05 pm, laying from the barge began which was towed at first by the tug and then when close to shore by the steam launch ‘Electric.’ The cable was then hauled ashore and into the cable hut, connected to the instruments, and reported to be perfect. Chiltern then laid the rest of the shore end and buoyed it off. Coaling the Great Eastern was finally completed on the 13th February and plans were made to begin laying cable the following day. The ship left her moorings and was in position ready for splicing the shore end to the cable on board by 9.15 am. This took place on board Chiltern and then the two vessels set sail for Aden at 5.05 pm. Splicing between the 1st Intermediate and Second Intermediate cables took place on the 15th at 12.04 pm., that between the 2nd Intermediate and the main cable at 8.38 pm. The laying went smoothly, weather was good and the only breaks in the routine was when the change from aft to fore tank on the 19th at 2.00 am and the change from fore tank to main tank on the 21st at 7.00 am. The ships arrived 10 nm off Aden on the 27th at 6.00 am. The weather was too rough for laying the shore end and the cable was buoyed. Laying the shore end was completed on the 2nd March at noon. The cable was opened to the public on the 14th March 1870. 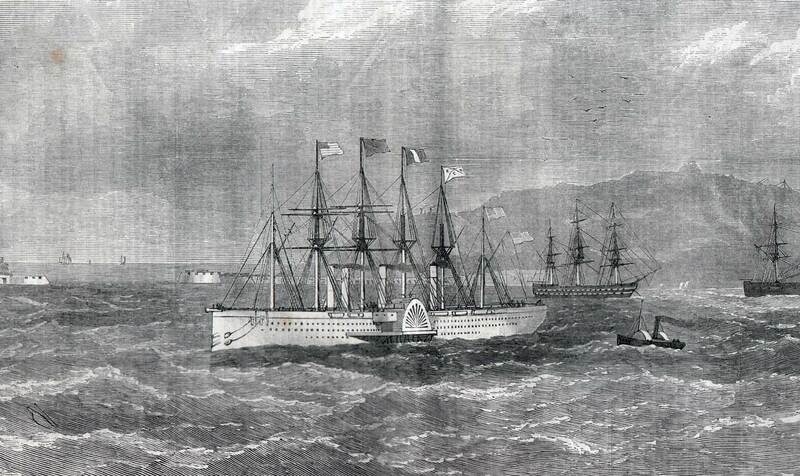 Captain Halpin had expected to see Hibernia at Aden when they arrived and with her non arrival he decided to press ahead and lay the remaining cable aboard Great Eastern. Chiltern had laid the shore end and buoyed it at 7.05 pm on the 3rd March. While doing this Chiltern pulled the cable out of the cable house when it became jammed in the paying out gear. Hibernia put in an appearance on the same day much to the relief of Captain Halpin. The expedition got under way at noon on the 6th March when the shore end was picked up by Chiltern and the Intermediate cable carried by Great Eastern was spliced on. The fleet then set sail towards Suez at 4.40 pm. Great Eastern exhausted her cable and buoyed the end at 7.40 pm on the 8th. At 7.30 am the next morning Hibernia picked up the cable and made the splice and laying began again at 11.40 am. Like the Bombay Aden run everything went smoothly. At 1.00 pm on the 11th the change was made from the main tank to the aft tank and at 1.00 pm on the 13th Hibernia buoyed the end of the cable. 2.30 pm Chiltern picks up the cable, completes the splice by 4.35 pm and at the same time the cables in the two tanks aboard Chiltern were also spliced. At 2.10 pm on the 15th Chiltern buoyed the end of the cable and shortly afterwards Hibernia sailed to find the William Cory, succeeding in doing so at 8.00 am on the 16th. Following their arrival at Suez, Hawk began laying the shore end on the 14th March, but because of its weight there was trouble getting it up to the cable house. In the end, 150 men and four mules were used. The next day Hawk completed the laying and William Cory spliced on and by 12.20 pm, both vessels were heading for Aden. All went well and on the 16th they sighted the Hibernia. At 1.15 pm finished paying out and buoyed the cable and the sailed with Hibernia back to the Chiltern. Due to bad weather it was impossible to pick up the cable and it wasn’t until the 19th that an attempt was made, but the cable parted. William Cory succeeded in hooking it and spliced on, all three vessels set out for the other end of the cable, the final splice being made at 4.15 pm on the 22nd. After laying the first section from Aden towards Suez, Great Eastern returned to Aden for coaling prior to sailing back to England via Cape Town. Hibernia, Hawk and William Cory returned to England via the Suez Canal. Chiltern was to be based at Aden as repair ship, having been purchased by the British-Indian Telegraph Company. All the surplus cable had been offloaded at Aden. See also the page on the Falmouth - Gibraltar - Malta section of the cable. An entertainment of great scientific and social interest, and of entire novelty in its way, was given on the night of Thursday week, by Mr. Pender, chairman of the British Indian Submarine Telegraph Company, and by Mrs. Pender, at their private house in Arlington-street. 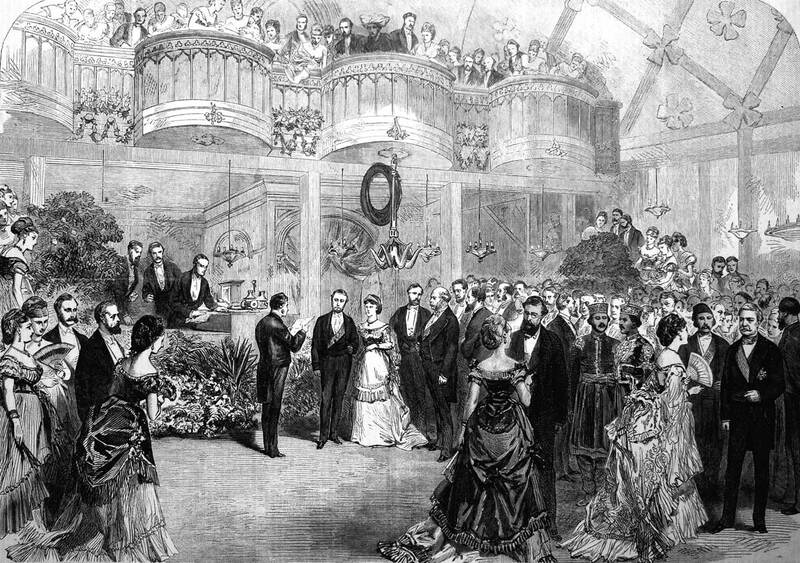 It was an evening party of invited guests to celebrate the successful laying of the last section, from Gibraltar to Cornwall, of the submarine telegraph cable furnishing direct and independent communication between England and Bombay, through the Indian Ocean, the Red Sea, the Mediterranean, and the Bay of Biscay. Amongst the company were their Royal Highnesses the Prince of Wales, the Duke of Cambridge, and Prince Teck; and several eminent men of science, Sir William Cook being one of them, with Sir James Anderson and Captain Halpin, of the Great Eastern, as well as M. Ferdinand de Lesseps, and other persons of distinction, were also present. In addition to the usual preparations for a festive reception of honoured visitors, Mr. Pender had fitted up one corner of the saloon as a telegraph office, and had placed it, by wires, in electric communication with distant parts of the world. Sir James Anderson officiated at the instruments, by which, during the evening, instead of the ordinary amusement of ladies at the piano, friendly messages were sent to and fro between different personages several thousand miles apart. To this message, which expressed a hope of “lasting union between the Eastern and Western hemispheres”—not only physical, but moral union—General Grant replied, with a characteristic American idiom, congratulating India upon its successful connection with “the balance of the world,” or, as we should say, the remainder of mankind. 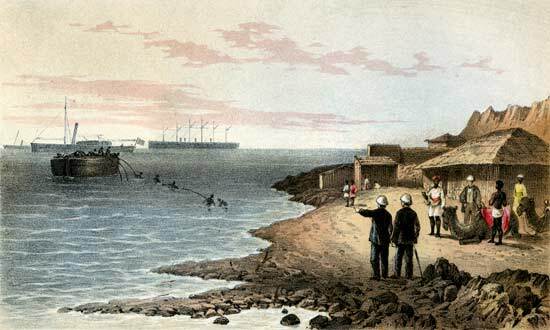 The Prince of Wales sent a despatch to the Khedive of Egypt, at Alexandria, and one to the King of Portugal, congratulating both on their new line of telegraphic communication with Great Britain, and each of those Sovereigns quickly replied. His Royal Highness also corresponded across the Atlantic with President Grant, who probably received the message three hours earlier than it was sent, there being fully that difference in the London and Washington times. 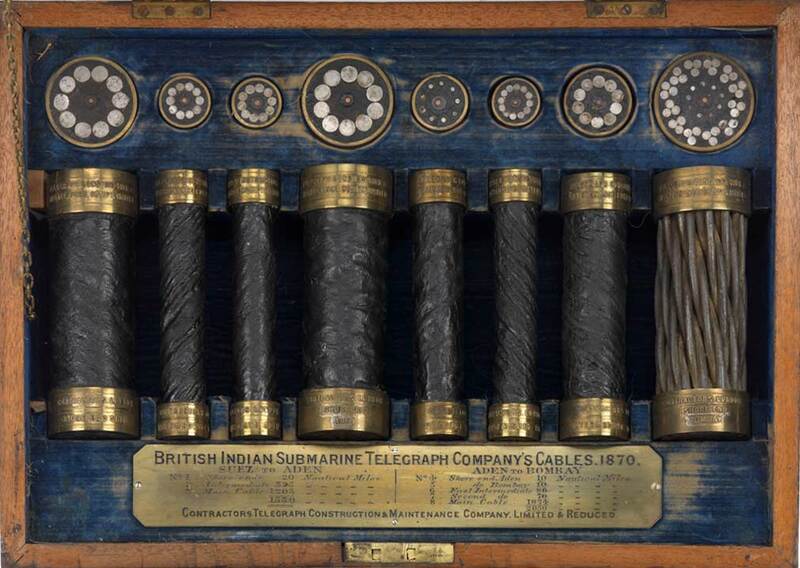 The Governor-General of India also received a message from the Prince of Wales congratulating him on the achievement of the submarine telegraph, which is sure to prove of immense advantage to the welfare of the whole empire. This was answered in appropriate terms by the Viceroy. A message sent by Sir Bartle Frere to Sir Seymour Fitzgerald, at Bombay, was acknowledged in five minutes, with the promise of an answer to follow as soon as Sir Seymour, who was in bed, could be called up. Messages also passed between the Viceroy of Egypt and M. de Lesseps, Mr. Fender and Mr. Cyrus Field, and various other persons. We must not omit to notice that Sir William Thomson’s siphon-recording instrument was this night exhibited for the first time in England. 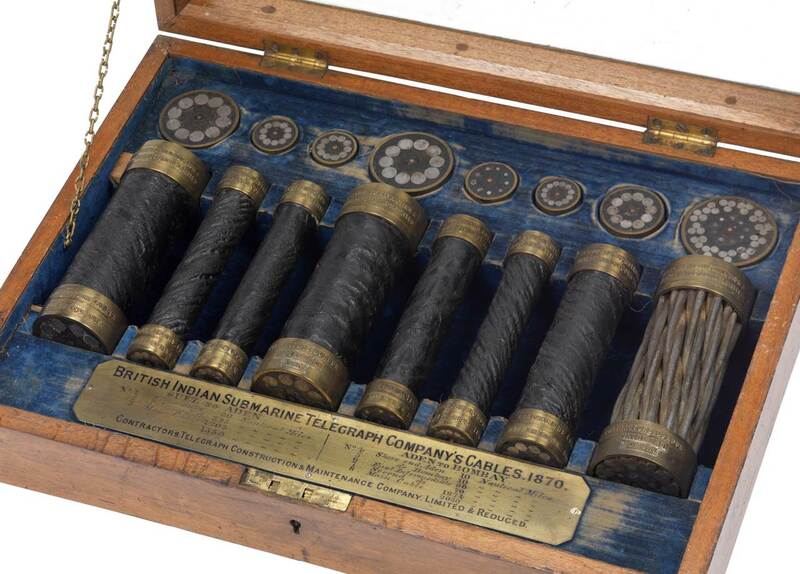 This remarkable instrument writes down in ordinary ink every fluctuation of the electric current received at the end of a submarine cable, and is likely to displace the mirror galvanometer, by which hitherto all messages through long cables have been received. 1) Shore end Suez - the core consists of seven copper wires coated with four layers of gutta percha alternating with four layers of Chatterton's compound covered with a cushion of tarred jute. The outer sheathing consists of ten iron wires covered with tarred hemp and compound. 2) Intermediate Bombay - ten wires in outer sheathing. 3) Intermedidate Aden - ten wires in outer sheathing. 4) Shore end Aden - ten wires in outer sheathing. 5) Bombay - Suez 1869 - nine wires in outer sheathing covered individually with a serving of hemp soaked in tar, india rubber and pitch. 6) Bombay - Suez 1869 - twelve wires in outer sheathing covered indivdually witha serving of hemp soaked in tar, india rubber and pitch. 7) Intermediate Bombay - ten wires in outer sheathing. 8) Shore end Bombay - outer sheathing consists of thirty-six iron wires in twelve strands.